CCS Presentation Systems has created the newest edition of its digital catalog, 2018 CCS Digital Catalog Vol. II. The catalog includes more than 200 pages detailing the products offered by CCS Presentation Systems. 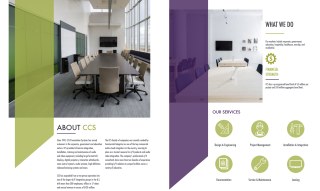 In addition, the catalog includes video demonstrations, various case studies, and descriptions of the services available from CCS Presentation Systems’ staff.